-NO 5AM Classes this week! -OPEN GYM for members! M,W,F 8:15 – 9:15am, T, Th 7:15 – 9:15am. -START UP FITNESS. Has it been a while since you’ve been to the gym? Feeling slightly terrified and need a gentle re-entry? 5 days a week, we are offering 3 different time slots: 11:00am – 11:45am, 12:00pm – 12:45pm, and 1:00 – 1:45pm. This is by RSVP only! 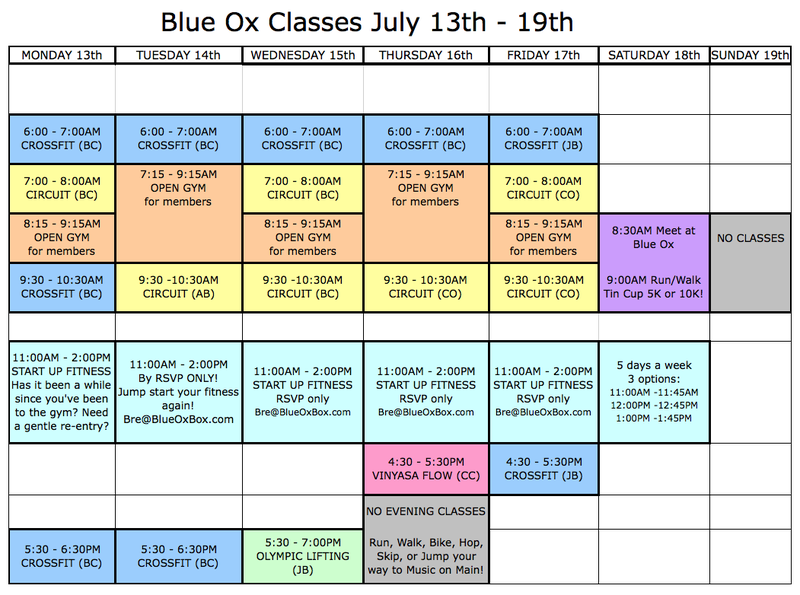 Please email Bre@BlueOxBox.com to set up your session today! -NO 5:30PM Thursday CrossFit. Instead, use your human power to propel yourself to Music on Main! It’s summer! -Please visit (and like!) our Facebook page for the latest information.